I’m sure you are reading this, because like me, you feel compelled to make a difference in this world. You would like to see love light and positivity manifested in the world, more than it is today. You would love to help people realize who they are, spiritually… Not just flesh and bone, but true, limitless spirit. I’m sure that just like me, you have a burning desire to bring love, light and happiness into this world and I’m sure that just like me you have done that for many years, with the people around you. Are you interested in learning more about and using nature’s finest healing tools for their mental, spiritual and physical benefits? Do you have the willingness to work towards a healthier more abundant life with more time freedom for yourself and your family? If you are like me, you would probably enjoy waking up when your body is ready, instead of waking up to an alarm clock every day. Or, you would prefer to have the freedom to spend quality time with your family, or out having fun instead of always having to go to work. What I want to talk to you about today is a way for you to truly have a powerful and deep impact on those you love and on the world as a whole while creating a better life for yourself. You will be able to do this by helping to align the spiritual, emotional and physical vibrations within yourself and for your friends, family and of thousands of people you don’t even know yet. You will be able to help help improve their spiritual connection and physical health all while ensuring that your day-to-day needs and your long-term abundance and wealth creation are taken care of. Let’s face it, we live in western society which means that we need shelter, we need to pay the electric bill, cell phone bills, internet, and we need to be able to buy food, etc. That’s just the nature of our world. And, while I’m sure like me, money is not your primary motivating factor in life, by necessity it must be an important factor. The quality of your life depends on it. You don’t know it yet, but In the next few minutes, you are going to learn how you can move forward towards living a life filled with more health, spiritual growth and abundance than ever before. I’m going to show you how you can use God’s natural miracles found in nature to help you spread light in the world for better health for you, for your family and your friends. At this point, you might be wondering who I am, and rightfully so! My name is Melanie Beckler and along with the help of my husband, and a few key teammates, I am sharing the positive alternatives for health, well-being and abundance that have had such a profoundly positive impact on my life. One of these teammates invited you to learn more here which is why you are reading this message now. First, before I explain exactly how all this can happen, I would like to tell you a quick story about how this manifested in my life. You see, one of my biggest challenges in walking a path of personal and spiritual development has been managing my emotions. Often times I would feel like I was making progress and out of nowhere, past challenging experiences or emotions would bubble up to the surface and totally overwhelm me. Also, being energetically sensitive, I was unknowingly tuning into the painful emotions of others and mistaking them as my own. Sometimes I would get off the phone with a friend or family member and feel tired or sad. Or, I would walk into a grocery store, and my mood would plummet from feeling happy and joyful to fearful and depressed without knowing what had happened. I do practice meditation to regain balance and I always ask the angels for help in these situations, which works to an extent. But quickly shifting out of lower vibrations can be challenging. I didn’t always have 15 – 30 minutes to meditate, so I was open to a tool that would help me shift my energy FAST. In 2009, my friend Richard introduced me to essential oils as a tool for shielding and protecting my energy and also for shifting out of lower vibrations, back into love. I started using these oils, and quickly found benefit in putting a drop in my hand, rubbing my hands together and taking a deep breath of the oil vapors to shield and protect my energy. This simple little process helped me immensely in maintaining a positive outlook and it even started boosting my immune system. In the last few months, I’ve learned and experienced even more about the incredible properties of essential oils and I now see the truth that these are truly divine healing tools from nature. Essential oils are the fastest and most effective way to use the power of nature to bring healing to your mind, body, and spirit, which is why I’m sharing all of this with you now. I now love my natural ‘medicine kit’ of therapeutic grade essential oils, and I have also found the oils to be hugely beneficial for my continued spiritual and personal growth too. In the last couple years, I have been traveling a great deal. It used to seem like every time I got on an airplane, I would arrive at my destination with a sinus irritation or cold. Now, I use the Thieves essential oil blend before and during flights by rubbing a drop on the bottom of my feet and in my hands. This powerful and completely natural immune boosting oil is amazing and I have not had a cold or sinus issues in months, ever since I began this practice and despite traveling on several 8 hour plus flights! Also, as a highly sensitive person, my skin is very sensitive too. A couple of summers ago I was living on the North Shore of beautiful Lake Tahoe. The water there is so crystal clear and blue, I ended up swimming in the lake almost every day. It was magical summer, but after weeks of swimming, my skin got irritated, and I developed a red splotchy area on my leg from what appeared to be a fungal infection. I started applying tea tree oil… Just a few drops at a time, and within a few days, it began to fade away. Within a couple weeks my skin had returned to normal and I continued to swim in the lake. Sacred Frankincense is another oil that I absolutely love. I use it to increase the frequency in my daily meditation by diffusing it into the air. I also rub frankincense oil on the bottom of my feet as an additional immune booster. While visiting my mother recently, she was complaining of neck and shoulder pain from a bicycle accident she had a few years ago. I pulled out my Pan Away and Deep Relief oils and she massaged them into her shoulder. Within minutes she felt the pain go away and noticed increased mobility in her shoulder which allowed her to relax and even sleep better. I continue to be amazed at the vibrational power and the healing properties quality essential oils carry, which is why I am excited to share this with you now. Essential oils are concentrated liquids extracted from various aromatic plants. These natural oils protect plants from insects, diseases and environmental hazards, and they contain similar benefits for people too. Medicine men and women, seekers and native cultures have long believed in healing not just your physical ailments, but your spiritual and emotional ones, too. For thousands of years, people have harvested natural remedies to bring healing to the mind, body and spirit. Natural remedies have been well received and extremely effective for millenia, and have been shown to be effective in laboratory settings today, as well as being used in real life scenarios. All over the world, natural remedies are recognized by mainstream medicine. In France, doctors are actually prescribing essential oils to assist the body in fighting off disease naturally, and without dangerous side effects so often experienced with pharmaceutical remedies. However, many of the oils you find for sale online or in stores are diluted with synthetic ingredients or extracted with chemical processing to create the oils and maximize profits for the company. The problem with these synthetic or diluted oils is that the end user (you) receives a product which has greatly reduced beneficial effects and even harmful ingredients added. It’s vitally important to use the highest quality essential oils, not perfume grade oils, oils made to be used in a lamp, or cheap oils found in local stores or online. Once you’ve found truly high quality oils you can trust, you will be amazed at the wide array of benefits essential oils can offer you. From cleaning your home, and cleansing your skin, to enhancing your mental focus and healing your mind, body and spirit, the effects and power of these oils is seemingly endless. The brand of oils I use, and the only one I recommend, is Young Living essential oils. They are literally the highest quality available. As a company, Young Living has been the leader in this industry for over 20 years. Not only does Young Living own and operate farms around the world, they are also involved in each step of the creation process of the oils, skin care products, eco home and cleaning products, so they can ensure the highest quality. With these high quality essential oils and products infused with oils, you are able to positively transform your home into a healthy, safe, positive and environmentally friendly home that will support you in living a healthier life with more well-being. In a moment you’re going to learn more about the essential oils, their health benefits and the additional natural products Young Living offers. Then, you will learn how these products offer you the chance to take control of your personal financial situation so you can create more abundance in your life, meaning more money, and more time-freedom. In total, there are hundreds of oils and thousands of benefits available from Young Living products. 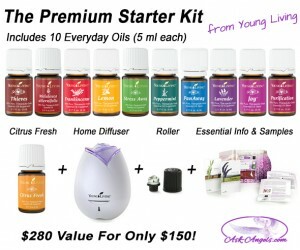 To get started, I recommend Young Living’s Everyday Essential oils kit. This kit has the best starting oils for you and your family. Frankincense has a warm and sweet scent, which promotes an increased spiritual connection, and is useful for visualization. During the times of Christ it was considered to be a holy anointing oil, with it’s value being even higher than gold! Today, frankincense will help you to release negativity, to center your energy, and to spiritually refocus. It is at the center of substantial research in hospitals regarding its powerful healing properties for the physical body as well. Lemon has long been touted for its detoxifying and healing properties. Lemon contains powerful antioxidants that are believed to boost the body’s natural defenses. Lemon oil’s fresh and zesty aroma also instantly invigorates and uplifts the mind. It can be used to flavor foods or clean and sanitize surfaces. Lemon is revitalizing for mind, body, and spirit as well. Lavender has a fresh, sweet aroma that is soothing and refreshing. It is the most versatile of all essential oils, and so no home should be without it. Lavender is a great aid for releasing stress, relaxing and winding down before bedtime, and yet it also has balancing properties that can also boost stamina and energy. Therapeutic-grade lavender is highly regarded for skin and beauty. It may be used to soothe and cleanse common cuts, bruises, bites, burns and skin irritations. Lavender may also be used to enhance the flavor of foods. Peppermint’s aroma and taste not only aids in digestion, but also promotes healthy respiratory health and eases tension. Another key benefit of peppermint is it’s refreshing properties that instantly engage the mind, awaken the body and generates focus. Peppermint is also useful in stimulating dreams, increasing awareness, and it’s great for reducing seasonal allergy symptoms. Joy is an exotic and lively blend of oils with uplifting overtones that create a wonderful and intoxicating aroma. It’s alluring fragrance promotes togetherness, love and even romance. When diffused it can be refreshing and energizing. This is a great oil to diffuse when the family is all together enjoying each others’ company, or playing games, or when you are feeling like you need a pick-me-up and to boost your mood. Purification® is a blend that can be used directly on the skin to soothe and cleanse your body. It can also be used to purify your home, and rid a room of any unwanted odors or smells. Spiritually it dispels lower vibrational energies and helps you to let go of what is no longer serving you. PanAway® is a powerful healing blend that contains wintergreen essential oil which is often used for massage, PanAway is soothing to the skin while providing comforting warmth to muscles after exercise. It’s perfect for releasing pain and tension from the physical body, as well as offering soothing to the emotional and spiritual being. The Thieves® blend is a proprietary blend of cloves, rosemary, and other aromatics which have been tested for its cleansing abilities. It is highly effective in supporting the immune system and good health. It also offers immensely powerful psychic and spiritual protection when worn or diffused in the home. Stress Away is a natural solution to every day’s stressors. It combines a phenomenal blend of oils, each with incredible healing, energizing and stress fighting oils. Stress Away is one of the first and only blends to contain lime and vanilla, as well as copaiba and lavender which fight mental rigidity and promote rejuvenation. Citrus Fresh™ is a relaxing, calming blend loved by children and adults alike. Rich in the powerful antioxidant d-limonene, it supports the immune system and overall health, while bringing about a sense of well-being, creativity, and feelings of joy. It also works as an air purifier. These oils are all available in Young Living’s Premium Starter Kit, and you receive a high quality diffuser as well, so you can enjoy the maximum benefits of the essential oils. As you continue to learn about and experience more essential oils, you will be amazed at their powerful properties for healing, cleaning, and promoting natural well-being. My positive personal experiences with these oils and products has lead me to not only make the choice to share Young Living essential oils, but I’ve been intuitively guided to offer you the chance to join in our mission of helping share the healing powers of essential oils too. When you get your Premium Starter Kit, not only will you receive the oils mentioned above, opening you up to hundreds of home remedies, but you can also begin sharing oils with people you know who can benefit from them, and you will receive profits from these efforts too. This means you are now able to align with more abundance in your life by joining our team of supportive and inspired co-creators who are ready to help you manifest a more healthy and abundant life with essential oils. This is your chance to join one of the most powerful movements of health, well-being and abundance that the world has ever seen and your timing couldn’t be better. Earlier I shared that I was going to tell you how to help align your spiritual, emotional and physical bodies, to bring all three into balance and how you can help other people at the same time. Now you have been introduced to the tools you can use to help your family, friends and thousands of others to experience more health and abundance in their lives. By sharing this information, your basic physical needs can be taken care of as you align with true abundance. Not only are you able to generate side income to help out with rent, bills, etc, but you have the potential to create significant, passive and recurring income that can elevate your lifestyle to levels you have only dreamt about before now. Have you ever had that feeling that you are supposed to be and do more than you are today? Have you ever wanted your life to have more meaning, more zest? Have you ever wanted to make a difference in this world? Have you ever had the desire or felt like you have the potential to help bring about a spiritual awakening in this world while at the same time you create wealth and abundance in your lifetime? Imagine if you had the time to pursue your spiritual goals… Imagine if you had more than enough money arriving at your home each month without going to a 9-to-5 job, five days per week. Imagine what it would be like to make a full time paycheck by helping yourself and others to be healthier, happier, more balanced, and to awaken your (and their) spirit too. What would your life be like if you had more income and more free time to spend with your family or doing the things you love each month? How would that make you feel? …Excited? …Fulfilled? …Blessed? I used to feel ‘stuck’, working multiple jobs I didn’t enjoy, and I rarely took the time to think about abundance or wealth because I was barely able to look beyond the next month’s rent payment or cell phone bill. With the help of a few mentors I learned about the life-changing benefits of building a business of my own and I started taking steps in the direction of what I wanted, which was more free time and more income. It took me 4 years of continuing to work ‘real jobs’ to pay the bills while taking steps forward in the evenings and on weekends to build my side business. In 2013 I gave notice to my boss and retired my alarm clock. Later that year I began traveling the world full time while continuing to build my business. As I write this, I’m currently enjoying summer in New Zealand while the US is having another harsh and cold winter. For me, the freedom to continue to earn money while traveling and experiencing other cultures is true abundance. I mention this not to brag, but to help give you a realistic idea of what is possible for you in a relatively short period time if you do want more out of life. Maybe traveling the world while working from your lapotp is not for you and you would simply like to retire your alarm clock and spend more time with your family and friends to enjoy gardening, volunteering, etc. Whatever it is you would like to do, I would like to help you do it. How I can help you live financially and emotionally free! I would like to invite you to join our rapidly growing team in sharing these healthy natural products, essential oils, and eco-friendly home products with people we know who can benefit from them. This is a grassroots effort where we work one-to-one to share the vision of healthy living and abundance with those we care about most. In addition, you can rest assured that just by using these essential oils, the people you help will be able to enjoy better health and a higher quality of life. It’s no accident that you are being introduced to this movement now. Something is happening in your life, seen or unseen, and this opportunity might just be the answer. Perhaps you have a growing dissatisfaction with your job, perhaps you just want to make a difference, or maybe you or someone you love is facing a health challenge which these essential oils can help with. This is the easiest “side business” you’ve ever seen. All you have to do is share your positive product experiences with a few key people, share our mission of increased well being and abundance, and help them in joining our mission do the same. This is the direct path to creating ongoing, lifestyle enhancing residual income. In order to join this mission, you will need to become an independent distributor for Young Living which happens when you purchase a premium starter kit. This kit includes all of the 11 everyday essential oils described above, a diffuser and some samples to share…. These oils and samples will give you what you need in order to experience the powerful benefits of essential oils so you can begin building your personal story with the products. We have had teammates, friends and family members enjoy less aching pains, decreased effects of arthritis, increased mental clarity, stronger immune systems, less colds and illnesses and better quality of life with Young Living products. Plus, nearly 100 teammates have earned profits with our team, already. After getting started, you will receive a unique Member Number that identifies you within their system. This allows you to earn profits on all products and kits sold with your member number attached. You will need to email me (melanie@ask-angels.com) your member number and I will give you all of your bonuses and add you to the team link rotator, right away! Once you’ve completed the above steps, send me your member number and I will happily share this opportunity with other seekers, like you… Only I will share YOUR member number rather than mine. In essence I’ll be helping build your business for you! You see, my website Ask-Angels.com receives over 500,000 visits per month and at the bottom of every post on that site, I am linking visitors to this page so they can learn about our team too. My email list has nearly 50,000 subscribers on it, and I share this exact page with every one of those subscribers, so they can have a chance to join our team too. On Facebook and YouTube, I’m connected with hundreds of thousands of others who I share essential oils and our mission with. Then, when these visitors click to join our team, they don’t receive my member number to sign up through… They can receive your member number! My commitment to you is that if you join and maintain the basic qualifications (I explain these all below) I will rotate in your Young Living member number along with our other teammates’ member numbers because I am 100% committed to helping you build this side business. Then, when you have friends or family members who are interested in our team and mission, I will help build their business and your business too. Since I have started this team building system, I have given away thousands in profits to teammates just like you who joined, instead of keeping them myself. Honestly, my idea to share Young Living essential oils through the Ask-Angels.com website and platform for your benefit is 100% in alignment with my ultimate goal of helping share more love, healing and abundance in the world. On my path of starting and building Ask-Angels.com, I have had many people selflessly help me get my start… This is my way of keeping in balance, by offering to help you start your own holistic home based business, if you are indeed interested. I’ve also been so blessed in getting to work from home or while traveling for years now, and have found that having the time-freedom to meditate, hike, read or even take a nap when needed has helped me immensely in growing spiritually. Don’t get me wrong, I work a ton… Often more than 40 hours per week but it’s on my time schedule, not anyone else’s. Also, it doesn’t feel like work when I’m sharing positive and uplifting tools of wellness and spiritual growth with wonderful people like you. Remember that it took me years of building my business on the side while juggling a ‘real job’ but honestly, the end result is so worth the effort that I’m inspired to help you do the same. Now is your chance to embark on a path towards personal and financial freedom, and I want to help you down that path. My husband Miles and I, along with our teammates in Young Living are all ready to help you create the life you want and deserve if you are ready to work towards that goal too. As I mentioned before, I’m being intuitively guided to leverage the Ask-Angels.com site and readership for your benefit and I have learned to follow this kind of guidance when I receive it, which is what I’m doing here now. There are also many reasons why you clicked through to read this message and learn about this opportunity. There are no coincidences in our world. Lastly, I know that together, we can create more positive change, abundance, and healing on a massive, world-changing scale than I ever could working alone. Exactly what will you will get from me when you join our team? #1 – Your Young Living link will be displayed to interested visitors of Ask-Angels.com, to email list subscribers and to Facebook followers to help grow your business. I am going to be incorporating essential oils into more of the posts and teachings on the site as well, and as I mentioned above, if you choose to join in on this mission, you will receive exposure to this entire, massive audience. I will send YOUR personal link out with a similar message to this one, selling the premium starter kit and opportunity for you, through your Young Living member number as a bonus for joining in on this mission. #2 – You will gain access to an exclusive team marketing system that you can use to promote your Young Living business, free! Other Young Living teams charge $14.95 per month for access to a personal site and marketing system. My husband and I are currently building a dedicated online system to help you grow your business, at no charge to you. #3 – You will have access to trainings, tips and support to help you build a rewarding and profitable business around sharing essential oils at our team training site. Whether you simply want to ‘go along for the ride’ and enjoy the products while earning a little income here-and-there with little effort, or if you want to truly work towards changing your life with your own holistic home based business, we are here to support you. To receive these ongoing benefits, every month, in addition to getting the premium starter kit, you will also need to make a monthly order of $100 in Young Living products through their Essential Rewards program. These are incredibly useful, healthy and natural products that you will be able to use for well-being, home care and more. -Natural skin care. Anti-aging products. Natural home care. Natural cleaning products. -High Quality Massage Oils. Natural Protein Powder supplements. -Healthy snack bars & weight loss supplements. -An antioxidant and nutrient rich energy drink. -Natural personal care products like shampoo, conditioner, soap, toothpaste, lip-gloss, etc. -Natural supplements like vitamins, green powder, omega supplements, etc. -And there is much, much more! With your $100 per month qualifying order you are able to purchase an array of these healthy products you are already spending on each month anyway. The best part is that these are much higher quality products than you are probably using, so your quality of life will go up, and it will only cost you a little more than you are already paying. The number of toxins in your body will decrease and your immune system’s ability to deal with problems will go up noticeably. This may cost an extra $25 – $35 per month but you will be getting far more in return than you can imagine right now. On top of getting higher quality personal care and home care products, I’m giving you a $37 membership to my website, so your $100 order each month literally doesn’t cost you a penny and will very likely save you a nominal amount of money each month. Lastly, when you order through the Essential Rewards program, you will receive 10% – 20% of what you spend back in points that you can spend like cash for additional Young Living products. Step #1 – Purchase a premium starter kit ($150 USD + Shipping) as a wholesale member through the link below so you can receive and experience the benefits of the Everyday Oils and receive information on how to use the oils along with other product samples. The retail value of this kit is $280. This purchase enrolls you as a Young Living independent distributor and offers you a unique member number so you can receive commissions when kits sell through your link and you will receive a 24% discount on future orders too. After completing this step, email me your Member Number (melanie@ask-angels.com) and I will begin promoting your Young Living link immediately. Step #2 – Make $100 in purchases of Young Living products each month so you qualify to receive commissions. You are able to choose from a variety of pre-made essential rewards product packs, you can purchase individual oils or you can choose a wide variety of healthy and natural home care, nutritional supplements or personal care products to meet this requirement. With this qualifying monthly order, you will not only be getting natural and healthy products you can use in your everyday life to maintain a healthy home, mind, body and spirit at a 24% discount, but I will also personally pay for you to have an Ask-Angels.com membership, a $37/mo value! Step #3 – Commit to using Young Living’s essential oils and natural products and sharing your positive experiences! The importance of starting with the premium starter kit is so you receive an array of different oils and products to use, enjoy, and learn about so you can have positive experiences you can honestly share with people you know. For your monthly purchases, you can choose anything from the entire Young Living product catalog and you can change your order every month, so you can order natural personal items one month (shampoo, conditioner, lotion, toothpaste, etc.) and then natural cleaning items or vitamins and health supplements the next. With the monthly order, you open yourself up to ongoing commissions, and you become a home based business owner, which is huge because it can open you up to many tax breaks. By working with your accountant to maximize your deductions this could potentially total thousands of dollars in savings! One thing I’ve learned in the last few years is that there are so many benefits from running a business, it really is amazing. Not just the income or financial benefits either, but the time freedom, the ‘wake up when you want’ freedom, and freedom of location too. It’s not an accident that you’re reading this letter right now! As I mentioned before, I don’t believe in coincidences, and I sincerely feel there’s a reason you’re reading this letter. Only you can say exactly why… Maybe you want more from life, maybe your job isn’t fulfilling, maybe you’re living in fear… Scared of losing everything you have. Whatever the reason, I’ve been guided to send this message out to you, and I know that the angels are trying to align me with those individuals who this is indeed for. All you need is a love for people, a desire for you and your family to live a more healthful, abundant and spiritual life, and the willingness to invest a few extra dollars each month to use some truly extraordinary household and personal care products that will increase the quality of your life. If you are a massage therapist, energy healer, holistic practitioner, or have the desire to transition into a holistic lifestyle or business, this is an incredible opportunity for you. If you are already successful in your current line of work, but would like to figure a way to replace your commuter-and-cubicle lifestyle with a work-from-home lifestyle, while benefiting from health and wellness products and spiritual growth tools, I can help. Is This Some Sort Of A ‘Get Rich Quick’ Plan? Not at all. This is a chance for you to have a positive impact in the world, help yourself, your family and others live a more healthy, spiritual lifestyle while at the same time building a holistic business in partnership with me and our other like-minded teammates. This is a chance to help free you from the mundane worries and challenges of the commuter lifestyle, if you so choose. If you have the desire to generate income, abundance and true wealth with this program, the potential is there. It is all about your willingness to share the products with people you know and encounter, because ultimately, you are responsible for your own success and helping others access the benefits of these products and our team’s vision are the path to lasting success with this program. If you join, I am going to be promoting your business to help you get your start, but if you want to see your side income grow to full-time, lifestyle income, you’ll need to promote our mission, products and team too. Remember, you will receive all of the tools and trainings you will need to help you do just that. Also, when you find teammates, friends or family members who join our cause, they will receive all the same bonuses, tools, trainings, and support too! The ‘trick’ is really in using and loving the products (which I can tell you honestly is easy to do) because it is simple and natural to recommend products you use and love. The bonuses you are able to access from this offer are designed to help you achieve your goals… They are not designed to achieve your goals for you. Personally, I have tuned in to the quality of these products and essential oils, to the integrity of the leaders of this company, as well as the potential benefits for our world and humanity that these products offer. I am excited for my vision of a healthier, more abundant future for you and for those you care about. I am going to be incorporating essential oils, Young Living products and this chance to partner with me into Ask-Angels.com in the coming weeks and months and this is your chance to let my efforts benefit your life, directly by joining our team now. If you are honestly interested, now is the time to take action, before everyone else learns about this program, so they can have a better chance of ending up on your team. It’s no mistake that you have learned about this chance to align with abundance and well-being through essential oils. Now is the time for you to tune in and notice that you are being nudged to join me in this mission of sharing natural health, well-being and abundance! Simply click on the button below, choose the Premium Starter Kit, and complete the process of getting started, now. After you complete the getting started process and order your kit, send me your member number so I can rotate in your link immediately to be sure you can receive benefits from my upcoming marketing efforts.